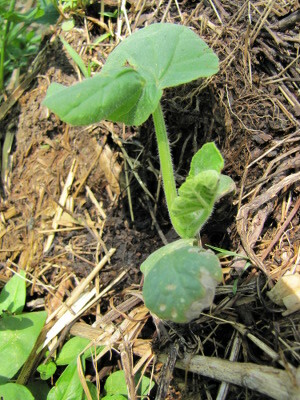 This butternut seedling is growing on the compost pile...along with a few dozen of his brothers and cousins. Whenever I walk by, I can't help but think about the anthropological hypothesis that agriculture may have begun when seeds like this sprouted out of early man's midden heaps. If you pay attention, you'll notice that some vegetables can put up with compost piles while others can't. At first, compost life sounds like living on easy street, but the conditions are actually a bit rough. Sure, there's plenty of extra fertility, but my volunteer butternuts have had to put up with undiluted urine baths a couple of times a week, with lots of high carbon materials to grow around, and with shifting soil as the compost pile settles. Despite these potential problems, volunteer tomatoes and squashes seem to prefer the compost heap to the garden. When you create a kill mulch and plant into it right away rather than letting the no-till garden mellow for a season before planting, you're growing in soil a lot like your compost pile. That's why I save crops that make good compost pile volunteers for our new no-till beds each summer, and give less hearty garden crops the older beds. Now I just have to decide whether to let thirty butternut plants sprawl out across the forest pasture or to turn the compost pile and crush these volunteers. For more information on the whys and hows of no-till gardening, check out our 99 cent ebook. I transplanted my compost volunteers, along with the compost they were growing in (it's still pretty fresh) into a bed where I've laid down cardboard for sheet mulching but never had the materials to finish it. Now I am just going to let everything rot/grow and see how it turns out. Hopefully it will be a nice bed to start with some less-tolerant plants next year. So far so good. Perfect use for compost pile volunteers! I had some cucumbers volunteer in the compost pile a couple years ago. I considered letting them go, but alas, the pile is in a shady spot. I would love to be able to transplant any and all volunteers that come up anywhere in my yard, but if you saw what postage stamp-sized backyard we currently have to garden in, you would understand why I don't. Oh, right, space issues! That's something we definitely don't have to deal with. The problem here is how to hold back from planting all 58 acres and wearing our fingers to the bone.